Ellen is a recent alumnus, graduating in May 2018, after attending Churchill Center & School for seven school years. 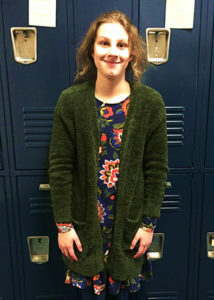 She was Churchill’s 2018 Herb Case Award recipient, displaying outstanding performance and growth in all areas of life at Churchill, as well as strong character, quiet leadership and concern for and service to others. Now in her first year at Westminster Christian Academy, Ellen continues to learn and grow in her studies and self-advocacy. She sent the following heartfelt letter to Churchill Teachers and Staff this fall. My start at Westminster is going great! Thank you for all you’ve done to prepare me for the future. I didn’t realize it at first when I came to Churchill, but without your assistance and mentoring my transition wouldn’t have been nearly as smooth. The strategies I learned at Churchill are implemented every day at Westminster. Churchill’s heavy focus on self-advocating, helped me frequently the first few weeks at Westminster! Westminster’s curriculum is difficult, but I am happy to report that I have straight A’s. The strategies I learned while attending Churchill are the keys to my success here. Math has always been a difficulty for me, as well as taking notes in class, but through my self-advocacy skills and hard work I am succeeding. Even though Westminster uses a different format for essays, my transitional English class helped me considerably. Your theater and art programs, are wonderful and naturally has given me an edge over the other students. I have joined both the Improv club and the Chess club. It’s hard to admit I have missed Churchill’s running program. (I will be taking part in track in the spring). My many years of Churchill prepared me for Westminster. So here’s to Churchill for helping me succeed in the higher field of high school! Known and described by her teachers as always persevering and never giving up, we have no doubt Ellen will continue to succeed and thrive! Way to go Ellen!